28 October 2011 – Perth, Western Australia – Today, the United Macedonian Diaspora (UMD) Perth/Western Australia Branch announced a special campaign “Australia, Recognise Macedonia Today! Prime Minister Gillard, Do The Right Thing!” to draw public attention to Australia’s lack of full diplomatic recognition of Macedonia’s rightful and constitutional name – the Republic of Macedonia. The campaign coincides with the Commonwealth Heads of Government Meeting (CHOGM), which is being held in Perth, Western Australia starting today through the 30th of October. Australia is home to the largest Macedonian émigré community outside of Macedonia. The Macedonian language is one of the most widely spoken languages in Australia. Perth Member in the Western Australian Parliament and also Shadow Minister for Culture and the Arts; Heritage; Multicultural Interests and Citizenship, Mr. John Hyde, joined the UMD Perth/Western Australia campaign through his Facebook page. 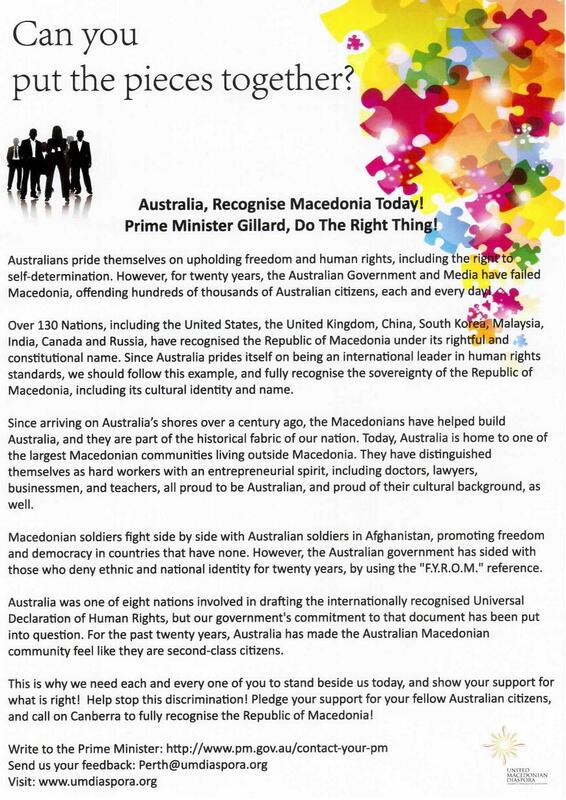 Thousands of flyers, calling on Australian citizens to show solidarity with the Australian-Macedonian community in urging Australia’s leadership to recognise Macedonia, have been printed and distributed throughout Perth, Western Australia. “The campaign hopes to draw the attention of Australian media and policymakers about an issue, which has been swept under the carpet for 20 years by the current and previous Australian governments, hoping that Macedonians will just ‘let it go,” said UMD Board Member and Perth/Western Australian Regional Representative Dame Krcoski. UMD Perth/Western Australia urges Prime Minister Julia Gillard to end a 20 year policy of treating the Australian Macedonian community as second-class citizens, siding with those who deny one’s right to self-determination and recognise Macedonia under its rightful and constitutional name – the Republic of Macedonia. Click here for PDF version of flyer, and here for JPG version of flyer. Prime Minister Gillard, Do The Right Thing! Macedonia, offending hundreds of thousands of Australian citizens, each and every day! Over 130 Nations, including the United States, the United Kingdom, China, South Korea, Malaysia, India, Canada and Russia, have recognised the Republic of Macedonia under its rightful and constitutional name. Since Australia prides itself on being an international leader in human rights standards, we should follow this example, and fully recognise the sovereignty of the Republic of Macedonia, including its cultural identity and name. Since arriving on Australia’s shores over a century ago, the Macedonians have helped build Australia, and they are part of the historical fabric of our nation. Today, Australia is home to one of the largest Macedonian communities living outside Macedonia. They have distinguished themselves as hard workers with an entrepreneurial spirit, including doctors, lawyers, businessmen, and teachers, all proud to be Australian, and proud of their cultural background, as well. Macedonian soldiers fight side by side with Australian soldiers in Afghanistan, promoting freedom and democracy in countries that have none. However, the Australian government has sided with those who deny ethnic and national identity for twenty years, by using the “F.Y.R.O.M.” reference. Australia was one of eight nations involved in drafting the internationally recognised Universal Declaration of Human Rights, but our government’s commitment to that document has been put into question. For the past twenty years, Australia has made the Australian Macedonian community feel like they are second-class citizens. This is why we need each and every one of you to stand beside us today, and show your support for what is right! Help stop this discrimination! Pledge your support for your fellow Australian citizens, and call on Canberra to fully recognise the Republic of Macedonia!